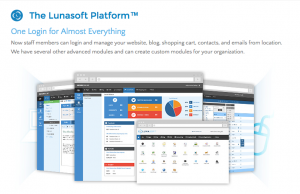 Since launching the LunaSoft platform, we've had dozens of clients come to us in hopes of getting off of the WordPress platform. They knew that there had to be a WordPress alternative for small businesses; and, as soon as they saw the Luna platform, they knew their hunt for the right solution had come to an end. For all of the amazing features WordPress has, it has an equal number of issues that make it the right platform for an amateur blogger and the wrong platform for a small business. It was out of our control because our clients had needs for their website to accomplish, and we didn't have the tools necessary to accomplish said desired functionality. Stories like those were the real inspiration for the creation of the Luna platform. We have been listening to the needs of our clients for years; and, for every problem brought up by a client, we developed a solution. After several years of developing solutions, we now have a WordPress alternative that can used by Businesses of all sizes to effectively edit, extend, and market their website. When someone asked if they could post to social media from the platform, we didn't tell them, "No, we can't do that." Instead, we built it and said, "Yes, our platform does just that." Almost any functionality you can get out of a WordPress site can now be replicated or made better by the Luna platform. And, as a closed source platform being monitored like a hawk by our engineering team, security is sealed up. As a small business, there is nothing worse than getting hacked. So, why take the risk? You need the tools, and we have the tools. Ready to learn more? Tell us what you need out of your website. I bet our platform does just that.